Taking a trip can be a boon for creative inspiration -- just think of the songs that sprang from The Beatles' time in India, or the even better songs that sprang from The Beatles' time on a whole 'nother kind of trip. For pocket-cessories inspired by less drug-addled journeys, hit Landmark & Lions' new e-store. 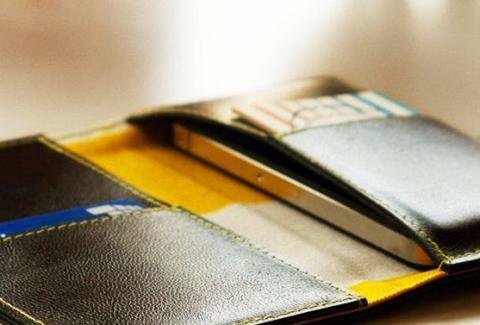 From a well-traveled abstract painter/interior designer in Minny, L&L's now e-peddling made-to-order wallets-and-whatnot inspired by trips to the English countryside and Italian Riviera, not to be confused with the Latin Rivera, as that would result in places to 'stache your cash. The freshly dropped goatskin leather Madison Collection starts with traditional jobs including a tri-pocket bifold, and two slim biz card cases with contrast stitching, while more unique is a cell case/wallet hybrid, avail in four shiny colors and lined with broad-striped linen, with pockets for cards, cash, and a smartphone, though if it's really that smart it might not approve of your spending habits. 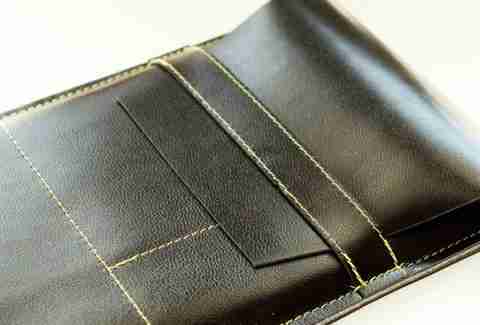 For the cashless, there're felt-lined smartphone cases that can be custom cut to the size of any device (in your choice of five colors), plus a tablet case designed to fit anything from a Kindle, to a Nook, to a "Dell Streak 7", whose name implies it's in dire need of a cover-up. If you're not into goatskin, she's even got a select few phone cases from a previous collection made entirely of felt, appropriate, as people on trips tend to get touchy-feely.